Troy Don Farr, age 57, longtime resident of Blair, Oklahoma, passed away Sunday, March 17, 2019, father of 3 and a friend of many. Troy was born on May 23, 1961 in Pasadena, Texas to Ruby and Don Farr. Troy moved to Blair, Oklahoma at the age of 6 where he attended and graduated Blair High School. There he was active in 4-H, FFA and baseball. He was known for his quick wit, his infectious smile and his loyal friendships. 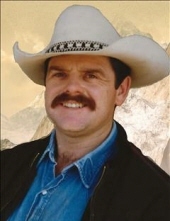 Troy was also known for his love of the outdoors, farming, ranching and doing anything on the back of a horse. He loved spending time with his children and grandchildren, playing dominoes and cards with friends and he also enjoyed dancing. He is preceded in death by his father Don and his son Jesse. Troy is survived by his mom Ruby, wife Cassie, son Seth, daughter Macy, sisters Tina and Tammy, and step-brother Terry, grandchildren Jace and Blakelee, best friend Tanya, aunt Jimmie and uncle Dennis, cousin Jerry Don, nieces Heidi, Hayley and Forrest. The family will receive friends at Visitation from 6:00 pm untill 8:00 pm on Friday evening, March 22, 2019 at Lowell-Tims Funeral Home in Altus, Oklahoma. A funeral service will be held at 2 pm on Saturday, March 23, 2019 at the Lowell-Tims Chapel, 1100 E Tamarack Rd. Altus, Oklahoma. In lieu of flowers donations may be made to NHSRA (National High School Rodeo Association) in honor of Troy Farr. To send flowers or a remembrance gift to the family of Troy Don Farr, please visit our Tribute Store. "Email Address" would like to share the life celebration of Troy Don Farr. Click on the "link" to go to share a favorite memory or leave a condolence message for the family.